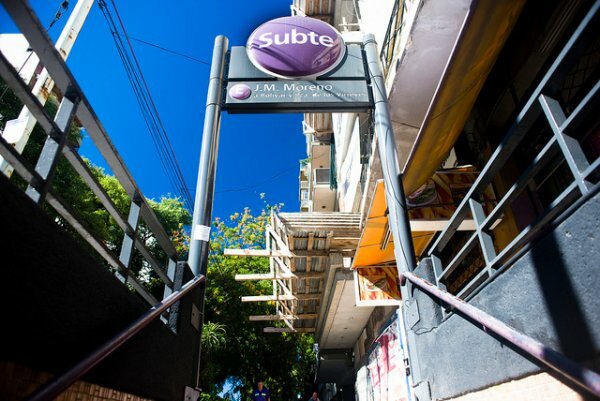 Subte Stories explores Buenos Aires’ lesser-known subte stops and the neighbourhoods they are found in, scoping out local stories and the best on offer within four blocks or less. 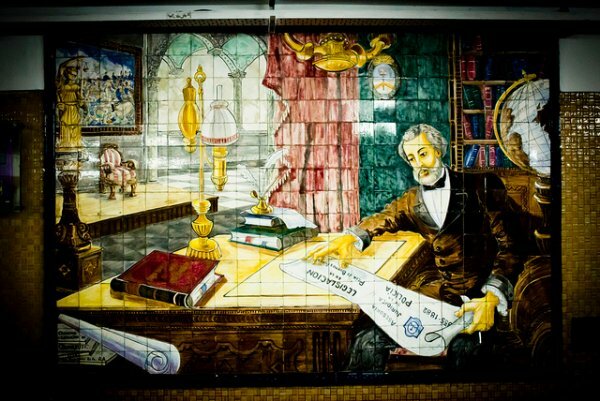 This week we retrace the steps of one of Argentine literature’s most innovative and controversial characters, on the E Line in Caballito. [Spoiler Alert: contains plot elements of “Kiss of the Spider Woman”]. Recently parolled prisoner 3018 Luis Alberto Molina ascends the steps of subte station José M. Moreno on a Friday evening, 1975. Early spring in Buenos Aires, the jacarandas have not yet flowered and the grey apartment blocks of Caballito rise up drearily around the young man, like enlarged duplicates of the prison walls he recently left behind. He proceeds uncertainly to the agreed upon location; he knows he is probably being followed. Manuel Puig’s “Kiss of the Spider Woman”, a classic of modern Argentine literature, places two distinct individuals in one prison cell and allows the reader to watch them grow as companions – Molina, a caring transsexual torn between his duties to others and the desire for personal happiness, and Valentin, a dedicated revolutionary hardened by the politics of the time and tortured by self-doubt. Their unlikely relationship blooms against the backdrop of an Argentina headed irreversibly towards the chaos of the dictatorship. In the two weeks since his release from prison for “corruption of a minor”, Molina has visited family and old friends. He accompanies his widowed mother to an operetta on the Avenida de Mayo, lingers outside cabarets in San Telmo and sits alone among the tattered seats of Belgrano movie theatres. He accepts a window-dressing job on calle Beruti in a half-hearted attempt to piece his life back together. He wanders the streets of Buenos Aires and dreams, paradoxically, of the prison he so greatly desired to escape. Our account of Molina’s demise comes in the form of an impersonal government report, “typed up in quadruplicate, for distribution only to authorised personnel”. Puig keeps his and his character’s thoughts secret, though as Molina walks north to the corner of Riglos and Formosa – followed discreetly by the notorious Ford Falcons of the porteño police – he is probably lost in the plotline of one of the films he so often conjured up to escape, momentarily, from reality. Molina is gunned down on a lonely street corner in Caballito, caught, like so many Latin Americans of his day, between the haphazard idealism of the left, and the fear-inspired repression of the right. Through him, Puig teaches us that imagination can be the most powerful instrument of resistance. José M. Moreno Station is located on the E Line, straddling the divide between Caballito and Parque Chacabuco. Inaugurated in July 1973, it would have been relatively new at the time of Molina’s last, fateful visit. It is named for the Argentine politician José María Moreno, who served as Minister of War during the Triple Alliance War against Paraguay. Self-guided “Spider Woman” tour – Familiarise yourself with this Argentine classic (available at Walrus and other English-language bookstores) and then see the city through Molina’s eyes. For an authentic recreation of his final days, start in Belgrano with a walk down Av Juramento. Linger over coffee at one the barrio’s confiterías, then catch a movie at the Belgrano Multiplex (Vuelta de Obligado and Mendoza). Window-shop along the leafy streets of Barrio Norte or broken sidewalks of San Telmo, then hop on the E Line to José M. Moreno. Walk the six blocks north to the corner of Riglos and Formosa, the final scene of the novel. Grán Depósito Caballito – While admittedly not as majestic as the better-known Palacio de Aguas Corrientes on Av. Córdoba, the Grán Depósito, constructed between 1912 and 1914, was Caballito’s tallest building for over 40 years, and bears witness to a period of the city’s history when even sanitary pump stations took their architectural inspiration from Europe. Like many dilapidated buildings in the south of the city, it has a certain haunting quality to it. Tía Margarita, Av. Pedro Goyena 496, 12-3pm and 8pm-12am. Directly across the street from the Grán Depósito is this hard to miss, bright pink corner restaurant, harking back to an earlier era of ostentation. Mediterranean dishes are big enough to share, and this abundance is reflected in the prices – dinner will cost you around $130 per person. Try the seafood pastas or paella valenciana. Le Petit II Panadería, Av. José M. Moreno 912. Parque Chacabuco’s Le Petit bakery, steps away from the neighbourhood’s titular park, was so popular that they opened this second location, Le Petit II, just underneath the 25 de Mayo highway at the corners of José M. Moreno and Zuviria. 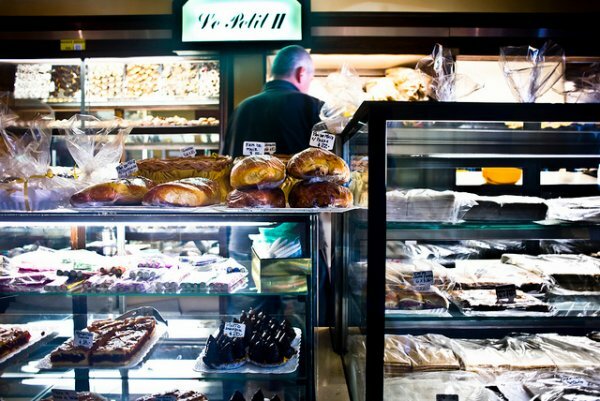 If eating beneath the roaring traffic of the city’s main thoroughfare doesn’t appeal to you, simply grab a table inside and relax with a nice cafecito and one of the many desserts or sandwiches on offer. Hemingway’s Grill & Bar, Av. Directorio 934, Tuesday through Sunday 7pm-12am. As far as I know, Ernest Hemingway never made it to Caballito, and most likely would’ve turned up his nose at the fancy frozen cocktails (about $32 at time of writing) this place is known for. But I imagine he’d appreciate the rough-and-tumble character of the barrio, as well as the simple negronis and Manhattans served at this clean, well-lighted bar and grill. Main courses run $45-$70. (About a 6-block walk from José M. Moreno station, you may want to continue on to Emilio Mitre station, instead). El Punto Bar, Av. Directorio 702, 7pm-6am. No-frills bar catering to the neighbourhood’s weekend and after-office crowd. Promos include two-for-one cocktails till 9pm Monday-Thursday, Ladies Night on Wednesdays, and Reggae Night every Thursday. Occasionally, the bar offers live music – check their website here (www.puntobar.com.ar) for more info. Content originally appeared at The Argentina Independent.